I entered this invitation in a design challenge for Hope Stamps Eternal. Great blog! You should check them out. They have tons of cute stuff. This card was easy to make. I layered the patterned paper over the card base and stamped 3 cupcakes on the white panel. I stamped one additional cupcake, cut it out and adhered it in the middle using pop dots to give the card added dimension. I colored them all with colored pencils and added crystal Stickles for a little sparkle. 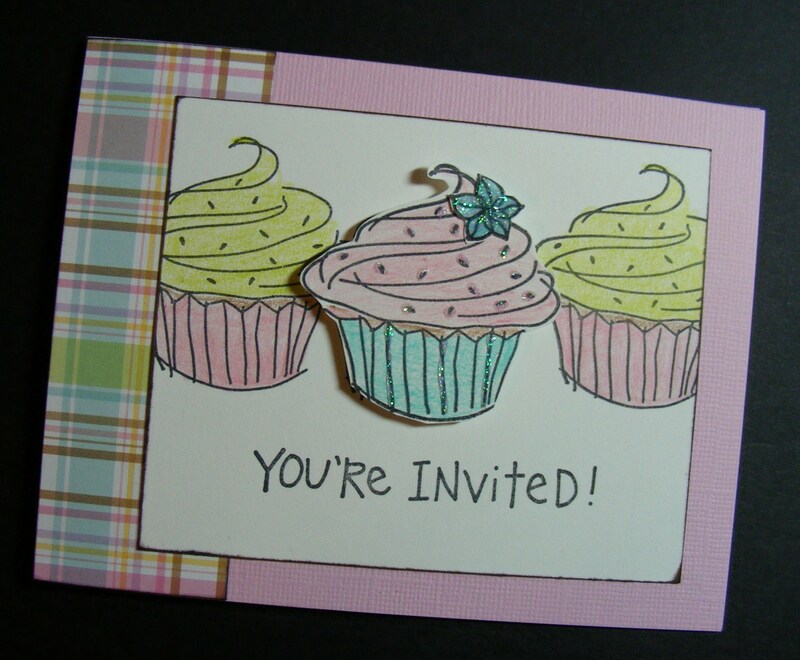 I stamped “You’re invited”, but you can stamp any sentiment you choose under the cupcakes. This entry was posted in Cards, Contests, Rubber Stamped Items and tagged birthday, Cake, cupcakes, party invitations, pink. Bookmark the permalink. So fun! Love the popped up cuppie in the center! Thanks so much for playing along with the challenge this week! Wonderful design and colors! Those cupcakes look so pretty in pastels, awesome card! Thanks for joining the Cupcake Inspiration Challenge this week!